Ortiz received 89 of 260 votes (34%). Jorge Alfaro finished second (71 votes, 27%). Adam Haseley (32, 12%) and Adonis Medina (24, 9%) finished third and fourth. Fourteen players collected the remaining 44 votes. Ortiz became the Phillies’ biggest international free agent signing when he signed for $4M on July 10, 2015 as a 16-year old. 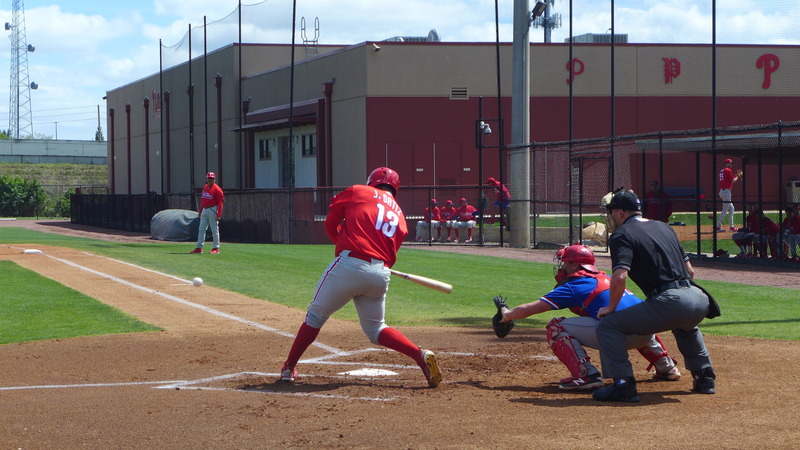 Ortiz spent the 2016 season with the Gulf Coast Phillies as a 17-year old. He finished the season with a .231/.325/.434/.758 slash that included 8 HR in 173 AB, 8 SB in 10 attempts, and 17 BB (8.6) and 53 K (26.9%). His 2016 baseball season started in March. It’s probable that he tired at the end of the GCL season. This could be born out by the .286/.394/.571 slash he had as late as July 26th. I think Ortiz is an interesting selection, one I have no problem accepting. I have followed him closely since he first arrived in Clearwater. I was impressed with his plate discipline during 2015 Instructs as a 16-year old. I marveled during the following spring and 2016 GCL season at the amount of ground such a big, young man could cover in right field. I was surprised at the strength of his arm and noticed that he looked for opportunities to show it off. And, I reveled at the easy power he exhibited during 2016 XST. Ortiz is further from the big leagues than a player like Jorge Alfaro, but if you value projection over proximity, he is an easy choice this early in the polling process. So far, it appears that Ortiz will not be a defensive liability albeit at a less critical position than Alfaro. And, his offensive tools, his power, and his early plate discipline would seem to give him the edge over Alfaro and other prospects. His signing bonus will likely lead fans to anticipate a high ceiling. His performance indicates that his floor is likely high, too. Next up is your selection for the #5 prospect in the organization with Eliezer Alvarez and Victor Arano added to the poll. Jhailyn is my #5 after #4 Haseley. What separates (just slightly) Haseley over Ortiz (and Alfaro) is the (big) risk factor. Nonetheless, I’m still fine with Ortiz as #4. Haseley is the next top prospect to me. You said lt almost exactly as I had it KuCo. Since I had Haseley at #3, he is my pick for 5. At no. 5 I’m going Kilome – had considered both Ortiz and Haseley for this slot. We’ll learn a lot about Hasely this year who I would expect to start at Clearwater while Moniak repeats Lakewood. I have no problem with Ortiz in the #4 slot. He has certainly shown that the big bonus was not a throw away like Encarnacion. I hope he starts in LKW and continues to move forward in his development. Somewhere along the line, I hope he ends the season 2 levels higher. I don’t think 2018 will be the year but 2019 is a strong possibility. I’m taking a look at Medina versus Kilome. Medina is a year and half younger. Kilome is 6’6″ to Medina’s 6’1″ but, if you believe the stats in Baseball-Reference, Medina is 185 lbs and Kilome 175. Those might be their signing weights but I can believe that Medina has a larger base than Franklin. Medina’s K/9 of 10 and BB/9 of 2.9 are very impressive for a 20 yo in LKW. Kilome didn’t play in LKW until he was 21 and had a 10.2 K/9 and 3.9 BB/9. Adondis’ WHIP in LKW was 1.187 and Kilome’s was 1.422 remembering Kilome was a year + older. I had Kilome over Medina but now I’ve talked my way into Medina over Kilome. I think if Kilome can put on some weight and strengthen his core, he’ll have a long successful career. Medina looks very solid right now and should be given the nod over Kilome IMO. In any event, I voted for Alfaro right here with Medina next and then Kilome after him. I have Medina over Kilome as well. Same. Kilome’s problems with command and his changeup have persisted and the further he moves up without showing improvement in those areas the less chance he’s got of reaching his considerable ceiling. Medina seems like a safer bet to actually become a mid-rotation starter. Kilome has the feel of one of those guys who has the stuff to be a 2 or a 3 but always seems to be falling short and ends up pitching like a 4 due to issue with command and consistency. It’s a somewhat unfair conclusion since I’ve rarely watched him pitch, but it’s just a nagging feeling I have about him, like I have a nagging feeling that MM is going to be a flat out bust, which, of course, is not the end of the world as the Astros had a flat out bust at 1/1 and just won a WS. By the way, so far my top 4 are the top 4 on our list, although I had the order slightly different I would have had them Kingery, Sanchez and JPC, but any order is perfectly defensible. I have the next three players as Haseley (who I like and think could take a very big leap forward this year, in fact, he’ll probably be my breakout candidate), Romero and Medina. I think Romero is going to be a flat out stud and a legit 2/3; the kind of pitcher the Cardinals always seem to draft. I like Medina a lot too, but he’s farther down in the chain and carries more risk (although he may bring a higher ceiling – I acknowledge that). I have them Sixto, Crawford and Kingery. I think Kingery’s best-case scenario is very exciting but I also think he has a higher bust potential than people are willing to admit. I also have Romero and Medina after Haseley but I’m not sure on the order. They’re very close, but it’s tempting to give the edge to the lefty who seems a little further along developmentally. 4. Ortiz – great year last year. The signs are positive so far. The only strike against him is proximity. Still needs to develop. 5. Haseley – I like what I saw last year. A year of getting stronger (no pitching training) and getting adjusted could help. Could have a huge surge forward. I really like him. 6. Romero – I love this guy. Could be a 2/3. 7. Medina – all reports are favorable. We’d be going nuts for him if it weren’t for Sixto. 8. Kilome – Lots of good progress, but I keep sensing that he’ll have trouble breaking through at high levels. Hope I am wrong. 9. Alfaro – tools are great, attitude is great, plate discipline is awful and will make it difficult for those tools to play up. Looks like a toolsy second division regular here, but I don’t think the Phillies are shooting for second division players, do you? 10. Randolph – actually did fine last year and hit for more power than expected. Not sure what kind of player he will become, but is still intriguing. 11. Quinn – barely a prospect, always hurt and getting older, but his raw tools are so amazing I’m keeping him on the list for now. 12. MM – I hope I’m wrong, but I’m sensing a full out bust here and he’s dropping like a stone in these ratings. By the end of this year we will have a much better idea of whether he still has potential. Imagine if we had taken Senzel. 13. Eshelman – I’m not a fan of soft tossers generally, but this guy has command that is out of this world. He will need to develop and command multiple pitches to achieve his potential, but I think, over time, he will be one hell of a pitcher. 14. Howard – really like the reports I heard. Could be a potential 2/3 down the line. Might have hidden potential like a Corey Kluber. 15. De Los Santos – like the reports, just don’t know enough about what to make of him to rank him higher. Kilome has been growing. He needs to stop getting taller and add some weight. Give him time. He will be a good pitcher. When its close, I try to separate the prospects by perceived trade value. That is who I think most other teams would request in a trade. I may be underestimating Jorge Alfaro’s value, but I’m going to go with Adonis Medina. That is the measuring stick I try to use as well when comparing certain guys – what prospect has the highest trade value and would be most coveted by other teams. I vote before reading comments but I took Medina here. I really consider Medina, Kilome, and De Los Santos all really close together . Haseley and Alfaro also could be taken here. I have no issues with the order so far as I consider the top 16-18 in the organization are worthy of being in top 10. Went with Alfaro with reservations. In the end, he plays a premium position and has premium abilities. Plate discipline will make the final determination on how his career goes.. Impressive ML triple slash aside, I can’t really get over the fact that Alfaro was terrible for most of the year in AAA. Added to his continuing struggles on defense and his “no longer that young” status, I see him as more of a back-of-the-top-10 prospect. Any love for JoJo Romero? The stat that jumps out to me on JoJo is his really high GB%. 50%+ for every level. Add in a 23% K rate and hitters are only putting the ball in the air 27% of the time. That is why he has such a low babip and hr rate. All good peripherals that project good performance at higher levels. I saw JoJo in person and came away impressed with his pick off move too. I thought it was very very good. I have him as good or slightly better than Ranger Suarez and as the top lefty in the system. Can’t really argue with that list; looks about right. Wish I could do this poll. But impossible to judge not seeing them imo. Stats in minors don’t always carry over to majors. but love Ortiz based on little I have seen. I have JoJo at eight. I put Jo Jo at five. Really tough to differentiate as a prospect between him, Suarez and Medina. I hope the Phillies stay the course at least for another year and don’t trade the young arms for some fringe #4 type starter. I saw them all more than once at Lakewood and it will be very difficult if not impossible for Lakewood to have a better rotation in the coming years when you add in Sanchez, Fanti and Falter. Hasely time. High draft pick with a pretty well-rounded game who should hopefully move quickly. I don’t put too much stock into SS numbers for college players, so we’ll get a much better idea about him during this year. Can see him taking the Benintendi route to the major, though that would see him in CBP by August this year….not sure if that will happen, but certainly in 2019 barring injuries. And he does not need to worry about preparing to pitch anymore, so playing and practicing for the field work should be a real plus for him. I went with Alfaro again but I’m fine with Ortiz at 4 and I can see Jo Jo, Haseley , or Medina here as well. JoJo as he is out best left handed starting option in the minors. philabaltfan….Falter, Fanti, Young, Hernandez and Irvin are all reliable lefties….but the one guy you do not want to sell short, after Romero, is last year’s 8th round pick Jhordany Mezquita. He is a bit older, turning 20 soon, but he may be in short-ball Williamsport this season and could be a real surprise. romus meant in terms of reaching the phillies. Speaking of good lefty prospects, Jim Salisbury says the Phillies might target Cole Hamels at the trade deadline should Texas fade early. He’d be a nice transition lefty until JoJo arrives. As I said, if the trade price is right he would be a perfect fit. I’ve had them Kingery, Sixto, JP, Ortiz and voted Hasley here. I must admit I may have a bias against pitchers. This was the good picture. Sorry about that. I just cut and pasted from a Google image search. “Competition”? Man, some people are so weird. Nobody makes money off of this. Reading will have some great pitching prospects come thru there this year. Kilome and Romero with Irvin while Sanchez, Medina, and Suarez could all earn a mid year promotion from a stacked Clearwater rotation. A huge jump per the other lists. I’m high on high, I thought I’d be out in LF if I put him this high, glad to see I’m not the only crazy one. I’m excited to see his play this year.